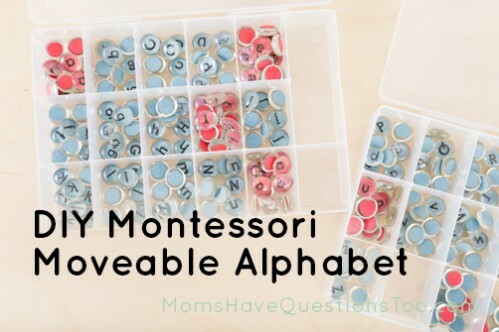 How can I make my own Montessori moveable alphabet and how do I use it? Here are some awesome ideas for using a moveable alphabet. As much as I wanted a moveable alphabet for Little Bear, I also didn’t want to spend a lot of money. Moving to a new house and having a new baby in one year tends to make a budget a little tighter. ;) So, I thought of a way to get a moveable alphabet set for Little Bear, without having to spend a ton of money. I think this project cost me $12 total and that includes the storage boxes. I made my DIY Montessori moveable alphabet using the exact same method I used to make my flat marble alphabet. The only difference is I used small glass gems rather than big ones and I made several sets of each letter in both uppercase and lowercase. 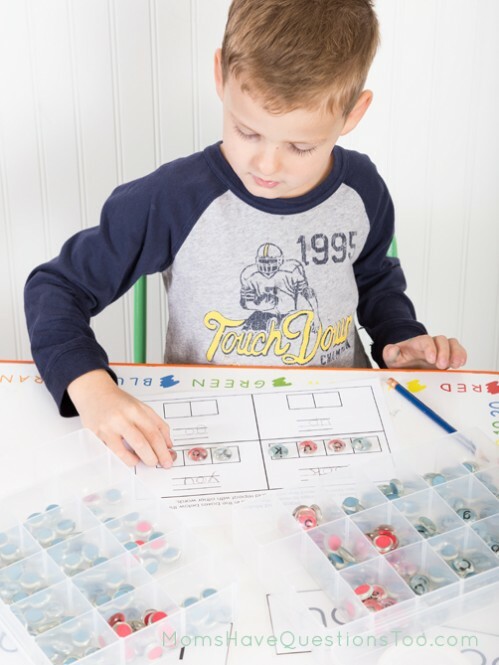 I did make a printable template for my moveable alphabet set, but it is included as a bonus in our Sight Word Curriculum (only $9.99 and it includes all 40 Dolch Pre-Primer sight words, over 300 pages of worksheets!). Since I am offering it as a bonus to the curriculum, I have decided to not offer it for free on my blog. 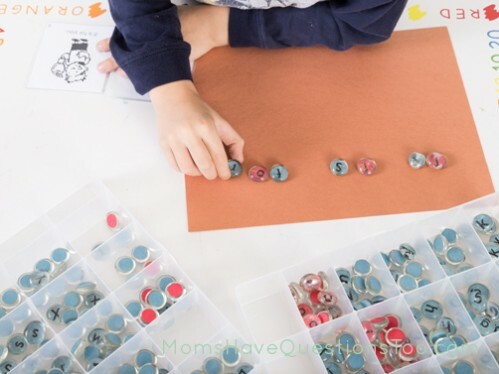 If you are interested in making your own DIY Montessori moveable alphabet, it should be pretty easy to figure out. You just need a few packages of small clear glass gems, red and blue construction paper, homemade mod podge, and some kind of storage container. If you want to make the process MUCH easier, you’ll also need a ½ inch circle puncher. Trust me when I say, it’s worth it to buy the circle punch because these circles are little! So far, we have loved our moveable alphabet. It has been great to use with the Sight Word Curriculum, but we use it for lots of other things too. It’s been a great learning tool for Little Bear. No Time for Flashcards, Train Up a Child, Teach Beside Me, 1+1+1=1, Living Montessori Now, In Lieu of Preschool, ABC & 123, Sun Scholars, All Our Days, Frogs and Snails and Puppy Dog Tails, Homeschool Creations, 123 Homeschool 4 Me, Teaching Mama, Cornerstone Confessions.